Before installing, it is important to remember that the FreeNAS® operating system must be installed on a separate device from the drive(s) that will hold the storage data. In other words, if you only have one disk drive you will be able to use the FreeNAS® graphical interface but won’t be able to store any data, which after all, is the whole point of a NAS system. If you are a home user who is experimenting with FreeNAS®, you can install FreeNAS® on an inexpensive USB thumb drive and use the computer’s disk(s) for storage. The latest STABLE version of FreeNAS® 9.3 can be downloaded from http://download.freenas.org/. FreeNAS® will only install to 64-bit hardware and the installer will not work on 32-bit hardware. .iso: this is a bootable installer that can be written to either a CD or USB flash as described in Preparing the Media. .GUI_Upgrade.txz: this is a compressed firmware upgrade image. 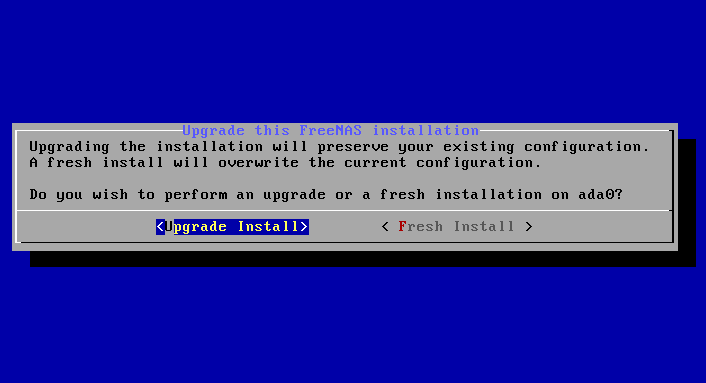 If your intent is to upgrade FreeNAS®, download this file and see the section on Upgrading. The value produced by running the command should match the value of the sha256.txt file. Beginning with version 9.3, FreeNAS® must be installed using a menu-driven installer, as the ZFS boot partition is created during the installation. To perform an installation, download the .iso file and write it to either a CD or a USB stick. To burn the .iso file to CD, use a CD burning utility. The command which is used to burn the .iso file to a compact flash card or USB thumbdrive depends upon the operating system. This section demonstrates utilities for several operating systems. Once you have written the .iso file to the installation media, make sure the boot order in the BIOS is set to boot from that device and boot the system to start the installation. On a FreeBSD or Linux system, the dd command can be used to write the .iso file to an inserted USB thumb drive or compact flash device. Example 2.2a demonstrates writing the image to the first USB device (/dev/da0) on a FreeBSD system. Substitute the filename of your .iso file and the device name representing the device to write to on your system. The dd command is very powerful and can destroy any existing data on the specified device. Be very sure that you know the device name to write to and that you do not typo the device name when using dd! If you are uncomfortable using this command, write the .iso file to a CD instead. if= refers to the input file, or the name of the file to write to the device. of= refers to the output file; in our case, the device name of the flash card or removable USB drive. You may have to increment the number in the name if it is not the first USB device. On Linux, use /dev/sdX, where X refers to the letter of the USB device. Insert the USB thumb drive and go to Launchpad ‣ Utilities ‣ Disk Utility. Unmount any mounted partitions on the USB thumb drive. Check that the USB thumb drive has only one partition, otherwise you will get partition table errors on boot. If needed, use Disk Utility to setup one partition on the USB drive; selecting “free space” when creating the partition works fine. This will show you which devices are available to the system. Locate your USB stick and record the path. If you are not sure which path is the correct one for the USB stick, remove the device, run the command again, and compare the difference. Once you are sure of the device name, navigate to the Desktop from TERMINAL, unmount the USB stick, and use the dd command to write the image to the USB stick. In Example 2.2b, the USB thumb drive is /dev/disk1, which is first unmounted. The dd command uses /dev/rdisk1 (note the extra r) in order to write to the raw device which is faster. When running these commands, substitute the name of the installation file and the correct path to the USB thumb drive. if you get the error “Resource busy” when you run the dd command, go to Applications ‣ Utilities ‣ Disk Utility, find your USB thumb drive, and click on its partitions to make sure all of them are unmounted. If you get the error “dd: /dev/disk1: Permission denied”, run the dd command by typing sudo dd if=FreeNAS-9.3-RELEASE-x64.iso of=/dev/rdisk1 bs=64k, which will prompt for your password. The dd command will take some minutes to complete. Wait until you get a prompt back and a message that displays how long it took to write the image to the USB drive. Windows users will need to download a utility that can create a USB bootable image from the .iso file. This section will demonstrate how to use Win32DiskImager to burn the .iso file. When downloading Win32DiskImager, download the latest version that ends in -binary.zip and use 7-Zip to unzip its executable. Once installed, launch Win32DiskImager and use its “browse” button to browse to the location of the .iso file. Insert a USB thumb drive and select its drive letter from the “Device” drop-down menu. Click the “Write” button and the image will be written to the USB thumb drive. With the installation media inserted, boot the system. 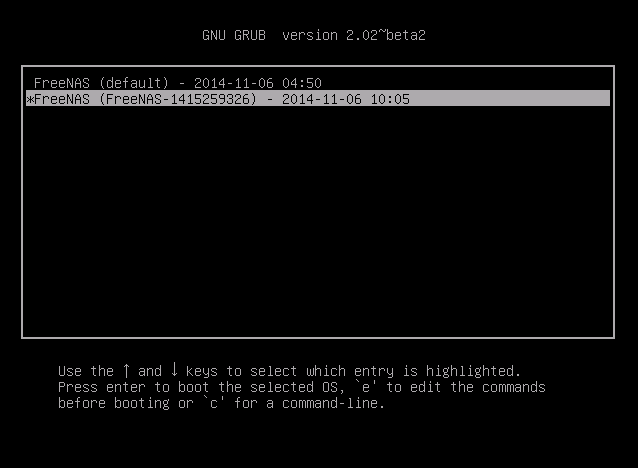 This should load the FreeNAS® installation’s GRUB menu shown in Figure 2.3a. if the installer does not boot, check that the installation device is listed first in the boot order in the BIOS. When booting from a CD, some motherboards may require you to connect the CD device to SATA0 (the first connector) in order to boot from CD. If the installer stalls during bootup, double-check the SHA256 hash of the .iso file. If the hash does not match, re-download the file. If the hash is correct, try burning the CD again at a lower speed or try writing the file to a different USB stick. Either wait for the menu to timeout or press Enter to boot into the installer. Once the media has finished booting, you will be presented with the console setup menu seen in Figure 2.3b. Press Enter to select the default option of “1 Install/Upgrade”. The next menu, seen in Figure 2.3c, will list all available drives, including any inserted USB thumb drives which will begin with da. 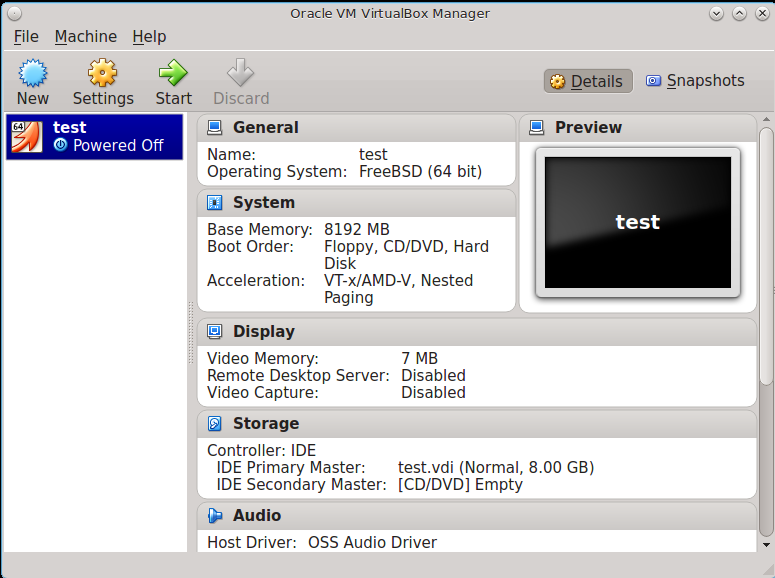 In this example, the user is performing a test installation using VirtualBox and has created a 8 GB virtual disk to hold the operating system. Use your arrow keys to highlight the USB, compact flash device, or virtual disk to install into and press the spacebar to select it. If you wish to mirror the boot device, arrow to the second device and press spacebar to select it as well. After making your selections, press Enter. FreeNAS® will issue the warning seen in Figure 2.3d, reminding you to not install the operating system onto a drive that is meant for storage. Press Enter to advance to the screen shown in Figure 2.3f. at this time, the installer does not check the size of the install media before attempting an installation. A minimum of a 8 GB device is required, but the install will appear to complete successfully on smaller devices, only to fail at boot. If you are mirroring the boot device, it is recommended to use devices of the same size; otherwise, the mirror will be limited to the size of the smallest device. The installer will recognize if a previous version of FreeNAS® 8.x or 9.x is already installed, and if so, will display the menu shown in Figure 2.3e. If the installer recognizes that a previous version of FreeNAS® is installed and you wish to overwrite the existing installation, arrow over to “Fresh Install” and press Enter twice to advance to the screen shown in Figure 2.3f. 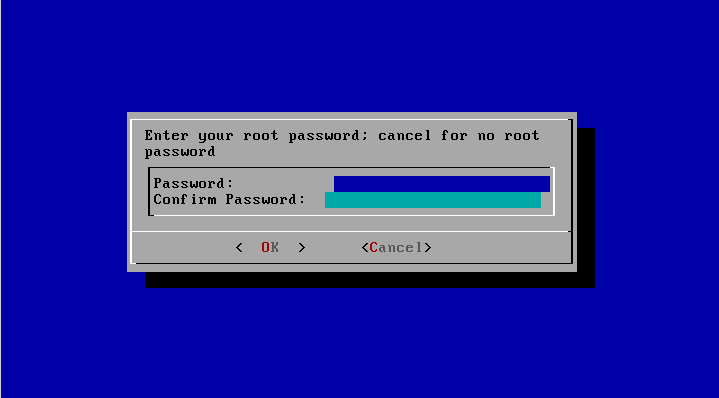 The next screen, shown in Figure 2.3f, prompts for the root password which is used to log into the administrative graphical interface. Setting a password is mandatory and the password can not be blank. Since this password provides access to the administrative GUI, it should be a hard-to-guess password. Input the password, press the down arrow key, and confirm the password. Then press Enter to start the installation. for security reasons, the SSH service and root SSH logins are disabled by default. Unless these are set, the only way to access a shell as root is to gain physical access to the console menu or to access the web shell within the administrative GUI. This means that the FreeNAS® system should be kept physically secure and that the administrative GUI should be behind a properly configured firewall and protected by a secure password. Once the installation is complete, you should see a message similar to Figure 2.3g. Press Enter to return to the first menu, seen in Figure 2.3a. Highlight “3 Reboot System” and press Enter. If booting from CD, remove the CDROM. As the system reboots, make sure that the device you installed to is listed as the first boot entry in the BIOS so that the system will boot from it. 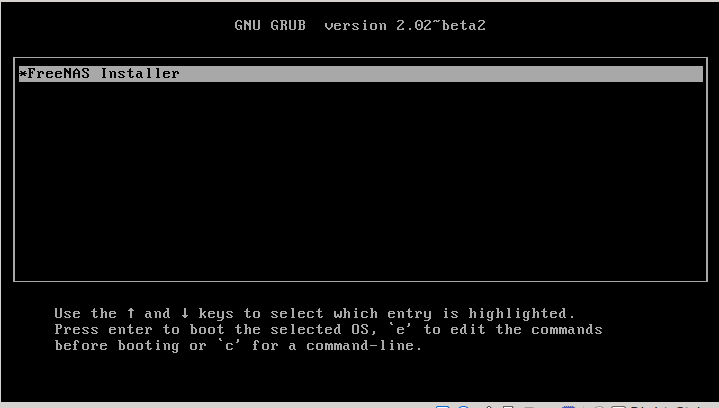 FreeNAS® should boot into the “Console Setup” menu described in Initial Configuration Wizard. If the system does not boot into FreeNAS®, there are several things that you can check to resolve the situation. First, check the system BIOS and see if there is an option to change the USB emulation from CD/DVD/floppy to hard drive. If it still will not boot, check to see if the card/drive is UDMA compliant. If the system BIOS does not support EFI with BIOS emulation, see if it has an option to boot using legacy BIOS mode. Some users have found that some brands of 4 GB USB sticks do not work as they are not really 4 GB in size, but changing to a 8 GB stick fixes the problem. If you are writing the image to a compact flash card, make sure that it is MSDOS formatted. go into the system BIOS and see if there is an onboard device configuration for a 1394 Controller. If so, disable the device and try booting again. If the system starts to boot but hangs at a mountroot> prompt, follow the instructions in Workaround/Semi-Fix for Mountroot Issues with 9.3. If the burned image fails to boot and the image was burned using a Windows system, wipe the USB stick before trying a second burn using a utility such as Active@ KillDisk. Otherwise, the second burn attempt will fail as Windows does not understand the partition which was written from the image file. Be very careful that you specify the USB stick when using a wipe utility! Upgrades to major releases, for example from version 9.3 to 10.0, can still be performed using either an ISO or the graphical administrative interface. Unless the Release Notes for the new major release indicate that your current version requires an ISO upgrade, you can use either upgrade method. Minor releases have been replaced with signed updates. This means that you do not have to wait for a minor release to update the system with a system update or newer versions of drivers and features and that you no longer have to manually download an upgrade file and its associated checksum in order to do so. The updater automatically creates a boot environment, meaning that updates are a low-risk operation. Boot environments provide the option to return to the previous version of the operating system by rebooting the system and selecting the previous boot environment from the boot menu. This section describes how to perform an upgrade from an earlier version of FreeNAS® to 9.3. Once 9.3 is installed, use the instructions in Update to keep the system updated. Upgrades from FreeNAS® 0.7x are not supported. The system has no way to import configuration settings from 0.7x versions of FreeNAS®, meaning that you will have to manually recreate your configuration, and if supported, import the FreeNAS® 0.7x volumes or disks. Upgrades on 32-bit hardware are not supported. However, if the system is currently running a 32-bit version of FreeNAS® and the hardware supports 64-bit, the system can be upgraded but any archived reporting graphs will be lost during the upgrade. UFS is no longer supported. If your data currently resides on one UFS-formatted disk, you will need to create a ZFS volume using other disk(s) after the upgrade, then use the instructions in Import Disk to mount the UFS-formatted disk in order to copy the data to the ZFS volume. If you only have one disk, backup its data to another system or media before the upgrade, format the disk as ZFS after the upgrade, then restore the backup. If your data currently resides on a UFS RAID of disks, you will not be able to import that UFS volume. Instead, you will need to backup that data before the upgrade, create a ZFS volume after the upgrade, then restore the data from backup. The initial configuration wizard will not recognize an encrypted ZFS pool. If your ZFS pool is GELI-encrypted and the Initial Configuration Wizard starts after the upgrade, cancel the wizard and use the instructions in Importing an Encrypted Pool to import the encrypted volume. You can then rerun the wizard afterwards, if you wish to use it for post-configuration, and it will recognize that the volume has been imported and will not prompt to reformat the disks. DO NOT upgrade the ZFS pool unless you are absolutely sure that you will never want to go back to the previous version. For this reason, the update process will not automatically upgrade the ZFS pool, though the Alert system will tell you if newer feature flags are available for the pool. Unless you need a new feature flag, it is safe to leave the ZFS pool at its current version and uncheck the alert. If you do decide to upgrade the pool, you will not be able to boot into a previous version that does not support the newer feature flags. The mps driver for 6G Avago SAS HBAs is version 20, which requires phase 20 firmware on the controller. It is recommended to upgrade the firmware before installing FreeNAS® or immediately after upgrading FreeNAS®, using the instructions in Alert. Running older firmware can cause many woes, including the failure to probe all of the attached disks, which can lead to degraded or unavailable arrays. While you can mismatch your firmware version with a higher version and things will “probably still work”, there are no guarantees as that driver and firmware combination is untested. Backup the FreeNAS® configuration in System ‣ General ‣ Save Config. If any volumes are encrypted, make sure that you have set the passphrase and have a copy of the encryption key and the latest recovery key. Once the upgrade is complete, use the instructions in Importing an Encrypted Pool to import the encrypted volume. Warn users that the FreeNAS® shares will be unavailable during the upgrade; you should schedule the upgrade for a time that will least impact users. Stop all services in Services ‣ Control Services. To perform an upgrade using this method, download the .iso to the computer that will be used to prepare the installation media. Burn the downloaded .iso file to a CD or USB thumb drive using the instructions in Preparing the Media. Insert the prepared media into the system and boot from it. Once the media has finished booting into the installation menu, press Enter to select the default option of “1 Install/Upgrade.” The installer will present a screen showing all available drives; select the device FreeNAS® is installed into and press Enter. 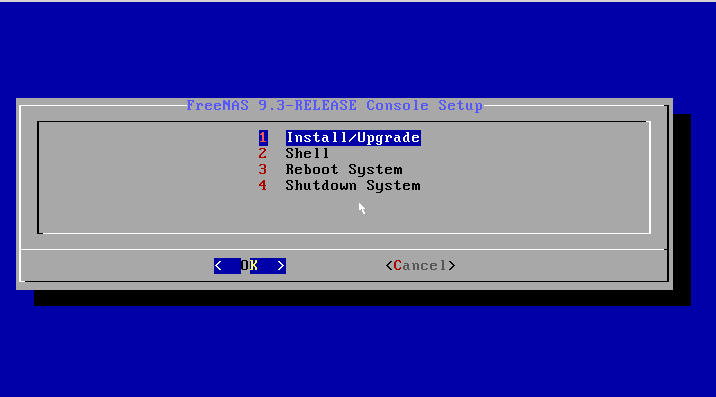 The installer will recognize that an earlier version of FreeNAS® is installed on the device and will present the message shown in Figure 2.5a. if you select to perform a “Fresh Install”, you will have to restore the backup of your configuration using System ‣ General ‣ Upload Config after you boot into the new operating system. To perform an upgrade, press Enter to accept the default of “Upgrade Install”. Again, the installer will remind you that the operating system should be installed on a disk that is not used for storage. Press Enter to start the upgrade. Once the installer has finished unpacking the new image, you will see the menu shown in Figure 2.5b. The database file that is preserved and migrated contains your FreeNAS® configuration settings. Press Enter and FreeNAS® will indicate that the upgrade is complete and that you should reboot. Press “OK”, highlight “3 Reboot System”, and press Enter to reboot the system. If booting from CD, remove the CDROM. During the reboot there may be a conversion of the previous configuration database to the new version of the database. This happens during the “Applying database schema changes” line in the reboot cycle. This conversion can take a long time to finish so be patient and the boot should complete normally. If for some reason you end up with database errors but the graphical administrative interface is accessible, go to Settings ‣ General and use the “Upload Config” button to upload the configuration that you saved before you started the upgrade. To perform an upgrade using this method, download the .txz file and its associated SHA256 hash to the computer that you use to access the FreeNAS® system. Then, go to System ‣ Settings ‣ Advanced ‣ Firmware Update as shown in Figure 2.5c. Use the drop-down menu to select an existing volume to temporarily place the firmware file during the upgrade. Alternately, select “Memory device” to allow the system to create a temporary RAM disk to be used during the upgrade. After making your selection, click the “OK” button to see the screen shown in Figure 2.5d. This screen again reminds you to backup your configuration before proceeding. If you have not yet, click the “click here” link. Browse to the location of the downloaded .txz file, then paste its SHA256 sum. The SHA256 hash is confirmed and an error will display if it does not match. If you get this error, double-check that you pasted the correct checksum and try pasting again. The new image is uncompressed and written to the operating system drive. This can take a few minutes so be patient. Once the new image is written, you will temporarily lose your connection as the FreeNAS® system will reboot into the new version of the operating system. FreeNAS® will actually reboot twice: once the new operating system loads, the upgrade process applies the new database schema and reboots again. Assuming all went well, the FreeNAS® system will receive the same IP from the DHCP server. Refresh your browser after a moment to see if you can access the system. If an update fails, an alert will be issued and the details will be written to /data/update.failed. To return to a previous version of the operating system, you will need physical or IPMI access to the FreeNAS® console. Reboot the system and watch for the boot menu. 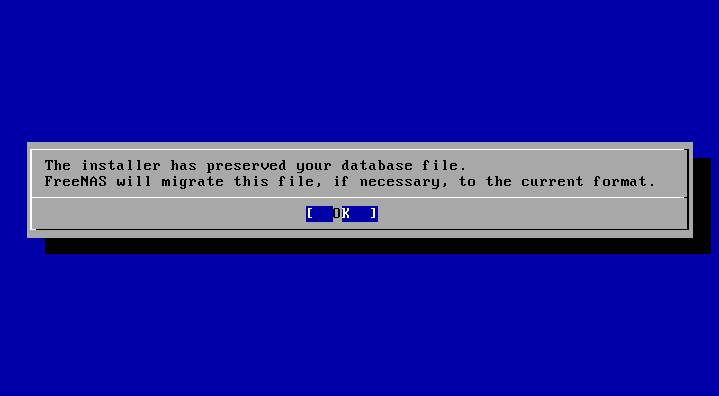 In the example shown in Figure 2.5e, the first boot menu entry, FreeNAS (default), refers to the initial installation, before the update was applied. The second boot entry, FreeNAS-1415259326, refers to the current version of the operating system, after the update was applied. This second entry is highlighted and begins with a star, indicating that this is the environment the system will boot into, unless another entry is manually selected. Both entries include a date and timestamp, indicating when that boot environment was created. To boot into the previous version of the operating system, use the up or down arrow to select it and press enter. Perform a fresh installation on a new boot device. Import your volumes in Storage ‣ Auto Import Volume. Restore the configuration in System ‣ General ‣ Upload Config. you cannot restore a saved configuration which is newer than the installed version. For example, if you reboot into an older version of the operating system, you cannot restore a configuration that was created in a later version. Beginning with FreeNAS® 9.3, ZFS pools can be upgraded from the graphical administrative interface. the pool upgrade is a one-way street meaning that if you change your mind you can not go back to an earlier ZFS version or downgrade to an earlier version of FreeNAS® that does not support those feature flags. before performing any operation that may affect the data on a storage disk, always backup your data first and verify the integrity of the backup. While it is unlikely that the pool upgrade will affect the data, it is always better to be safe than sorry. 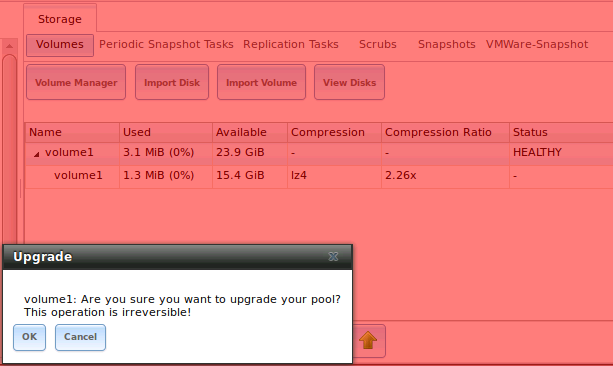 upgrading a ZFS pool is optional. You do not need to upgrade the pool if you do not need newer feature flags or if you want to keep the possibility of reverting to an earlier version of FreeNAS® or repurposing the disks in another operating system that supports ZFS. If you do decide to upgrade the pool to the latest feature flags, you will not be able to import that pool into another operating system that does not yet support those feature flags. To perform the ZFS pool upgrade, go to Storage ‣ Volumes ‣ View Volumes and highlight the volume (ZFS pool) to upgrade. Click the “Upgrade” button as seen in Figure 2.5f. if the “Upgrade” button does not appear, the pool is already at the latest feature flags and does not need to be upgraded. The warning message will remind you that a pool upgrade is irreversible. Click “OK” to proceed with the upgrade. The upgrade itself should only take a seconds and is non-disruptive. This means that you do not need to stop any sharing services in order to upgrade the pool. However, you should choose to upgrade when the pool is not being heavily used. The upgrade process will suspend I/O for a short period, but should be nearly instantaneous on a quiet pool. FreeNAS® can be run inside a virtual environment for development, experimentation, and educational purposes. Please note that running FreeNAS® in production as a virtual machine is not recommended. If you decide to use FreeNAS® within a virtual environment, read this post first as it contains useful guidelines for minimizing the risk of losing your data. This section demonstrates how to create and access a virtual machine within the VirtualBox and VMware ESXi environments. VirtualBox is an open source virtualization program originally created by Sun Microsystems. VirtualBox runs on Windows, BSD, Linux, Macintosh, and OpenSolaris. It can be configured to use a downloaded FreeNAS® .iso file, and makes a good testing environment for practicing configurations or learning how to use the features provided by FreeNAS®. 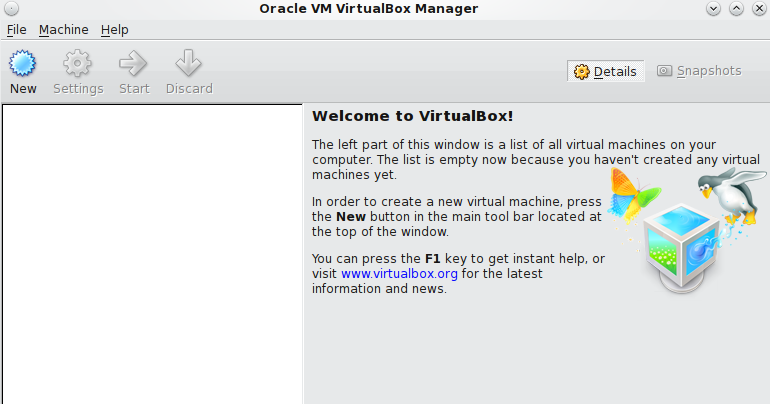 To create the virtual machine, start VirtualBox and click the “New” button, seen in Figure 2.6a, to start the new virtual machine wizard. Click the “Next” button to see the screen in Figure 2.6b. 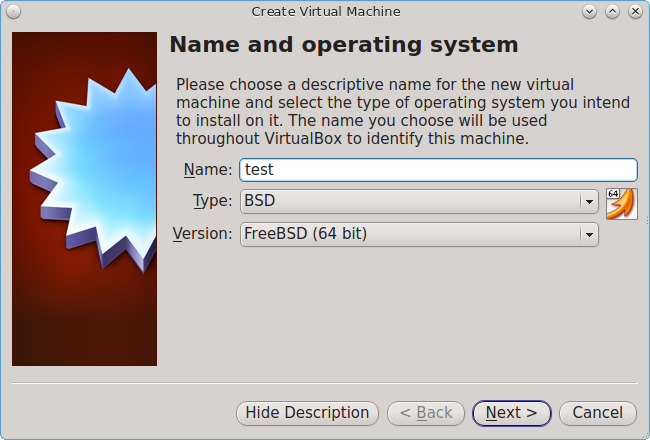 Enter a name for the virtual machine, click the “Operating System” drop-down menu and select BSD, and select “FreeBSD (64-bit)” from the “Version” dropdown. Click “Next” to see the screen in Figure 2.6c. The base memory size must be changed to at least 8192 MB. When finished, click “Next” to see the screen in Figure 2.6d. 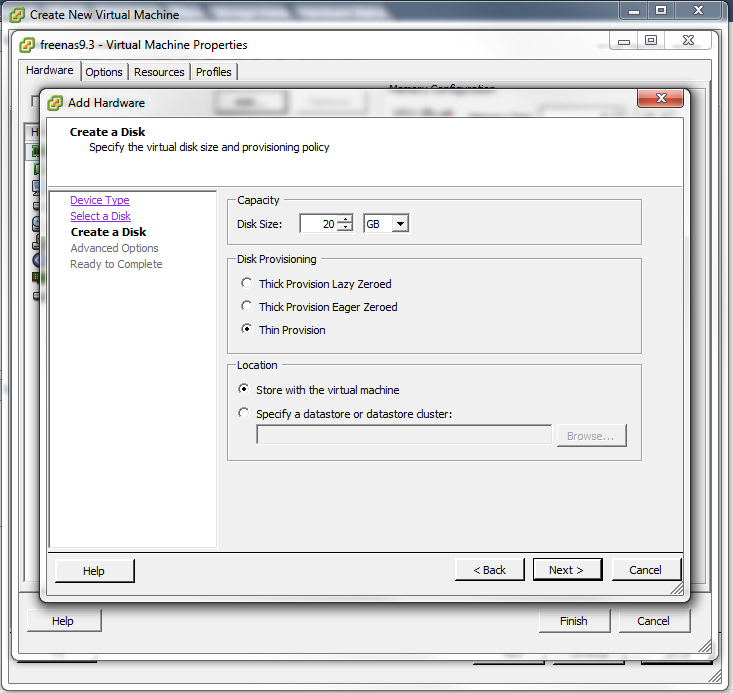 Click “Create” to launch the “Create Virtual Hard Drive Wizard” shown in Figure 2.6e. 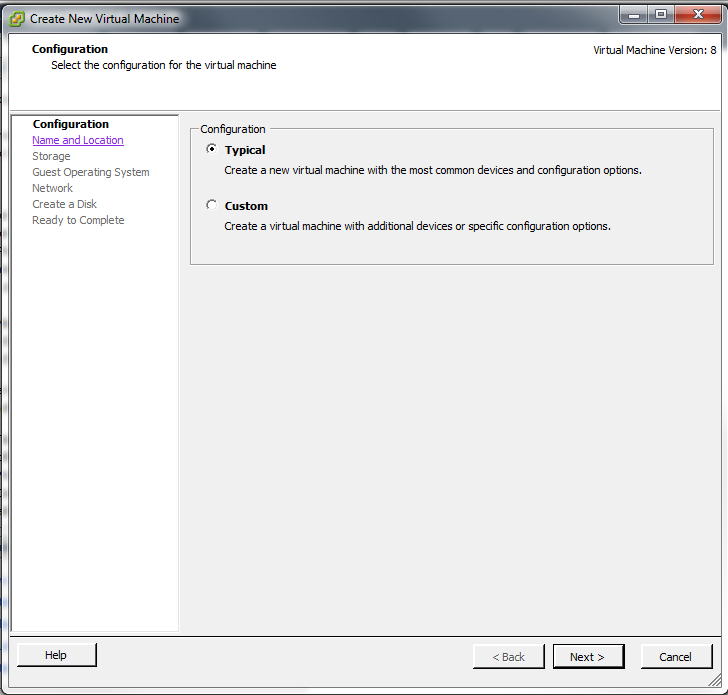 Select “VDI” and click the “Next” button to see the screen in Figure 2.6f. You can now choose whether you want “Dynamically allocated” or “Fixed-size” storage. The first option uses disk space as needed until it reaches the maximum size that you will set in the next screen. The second option creates a disk the same size as that specified amount of disk space, whether it is used or not. Choose the first option if you are worried about disk space; otherwise, choose the second option as it allows VirtualBox to run slightly faster. Once you select “Next”, you will see the screen in Figure 2.6g. This screen is used to set the size (or upper limit) of the virtual machine. Increase the default size to 8 GB. Use the folder icon to browse to a directory on disk with sufficient space to hold the virtual machine. Once you make your selection and press “Next”, you will see a summary of your choices. Use the “Back” button to return to a previous screen if you need to change any values. Otherwise, click “Finish” to finish using the wizard. The virtual machine will be listed in the left frame, as seen in the example in Figure 2.6h. Next, create the virtual disk(s) to be used for storage. Click the “Storage” hyperlink in the right frame to access the storage screen seen in Figure 2.6i. Click the “Add Attachment” button, select “Add Hard Disk” from the pop-up menu, then click the “Create New Disk” button. 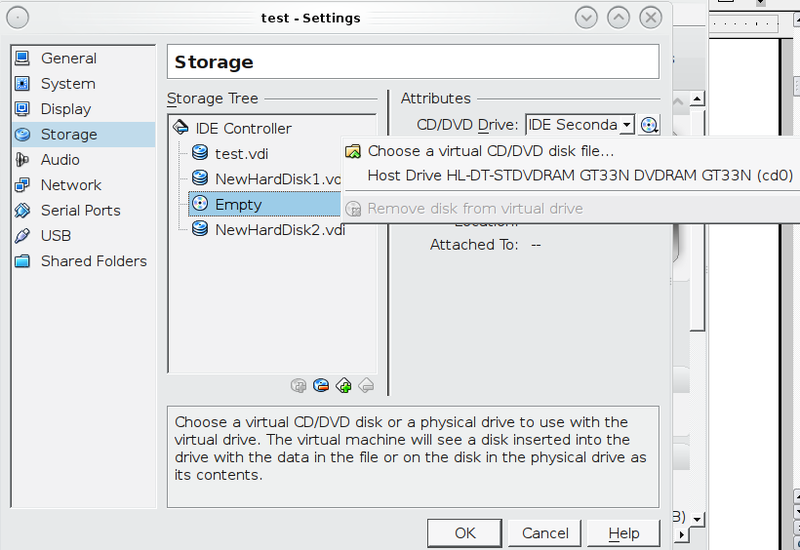 This will launch the Create New Virtual Hard Drive Wizard (seen in Figures 2.2e and 2.2f). Since this disk will be used for storage, create a size appropriate to your needs, making sure that it is at least 4 GB in size. 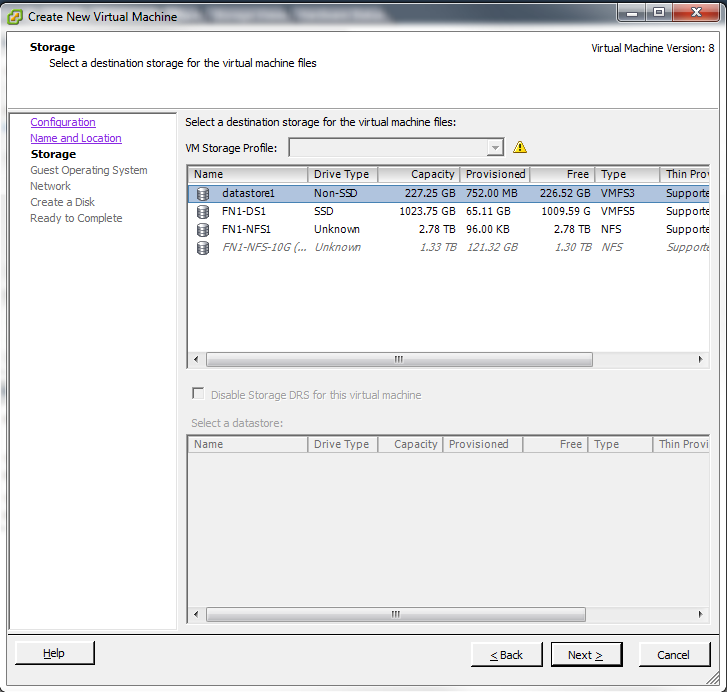 If you wish to practice RAID configurations, create as many virtual disks as you need. 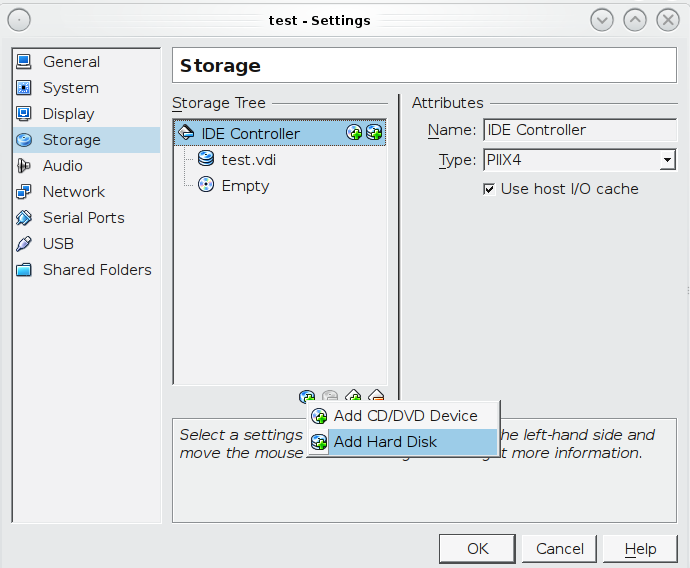 You will be able to create 2 disks on the IDE controller. If you need additional disks, click the “Add Controller” button to create another controller to attach disks to. Next, create the device for the installation media. Highlight the word “Empty”, then click the “CD” icon as seen in Figure 2.6j. Click “Choose a virtual CD/DVD disk file...” to browse to the location of the .iso file. Alternately, if you have burned the .iso to disk, select the detected “Host Drive”. Depending upon the extensions available in your CPU, you may or may not be able to use the ISO. If you receive the error “your CPU does not support long mode” when you try to boot the ISO, your CPU either does not have the required extension or AMD-V/VT-x is disabled in the system BIOS. if you receive a kernel panic when booting into the ISO, stop the virtual machine. Then, go to System and check the box “Enable IO APIC”. 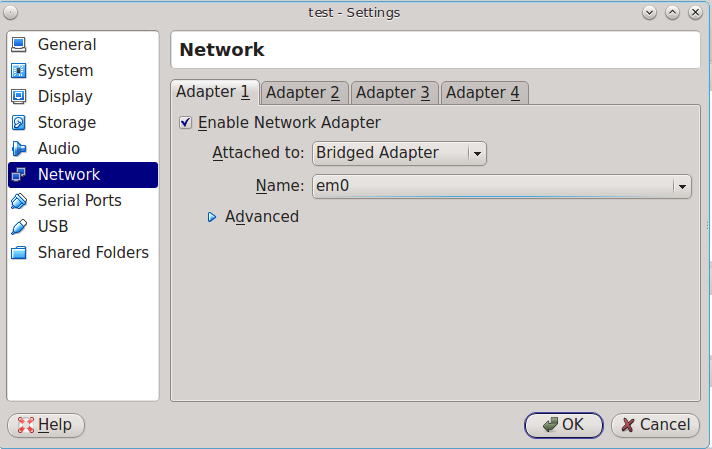 To configure the network adapter, go to Settings ‣ Network. In the “Attached to” drop-down menu select “Bridged Adapter”, then select the name of the physical interface from the “Name” drop-down menu. In the example shown in Figure 2.6k, the Intel Pro/1000 Ethernet card is attached to the network and has a device name of em0. Once your configuration is complete, click the “Start” arrow and install FreeNAS® as described in Performing the Installation. Once FreeNAS® is installed, press “F12” to access the boot menu in order to select the primary hard disk as the boot option. You can permanently boot from disk by removing the “CD/DVD” device in “Storage” or by unchecking “CD/DVD-ROM” in the “Boot Order” section of “System”. If you are considering using ESXi, read this post for an explanation of why iSCSI will be faster than NFS. ESXi is is a bare-metal hypervisor architecture created by VMware Inc. Commercial and free versions of the VMware vSphere Hypervisor operating system (ESXi) are available from the VMware website. Once the operating system is installed on supported hardware, use a web browser to connect to its IP address. The welcome screen will provide a link to download the VMware vSphere client which is used to create and manage virtual machines. Once the VMware vSphere client is installed, use it to connect to the ESXi server. To create a new virtual machine, click File ‣ New ‣ Virtual Machine. 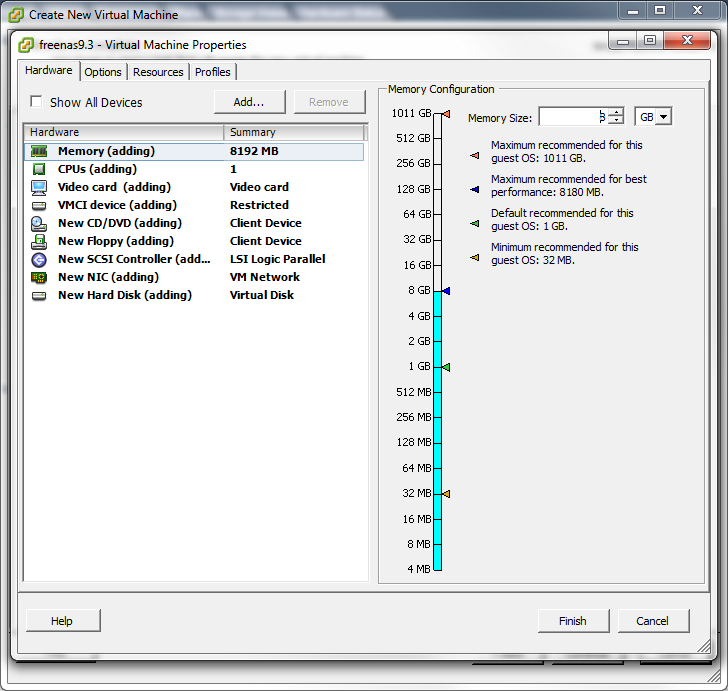 The New Virtual Machine Wizard will launch as seen in Figure 2.6l. Click “Next” and input a name for the virtual machine. Click “Next” and highlight a datastore. An example is shown in Figure 2.6m. Click “Next”. In the screen shown in Figure 2.6n, click “Other” then select a FreeBSD architecture that matches the FreeNAS® architecture. Click “Next” and create a virtual disk file of 8 GB to hold the FreeNAS® operating system, as shown in Figure 2.6o. Click “Next” then “Finish”. Your virtual machine will be listed in the left frame. 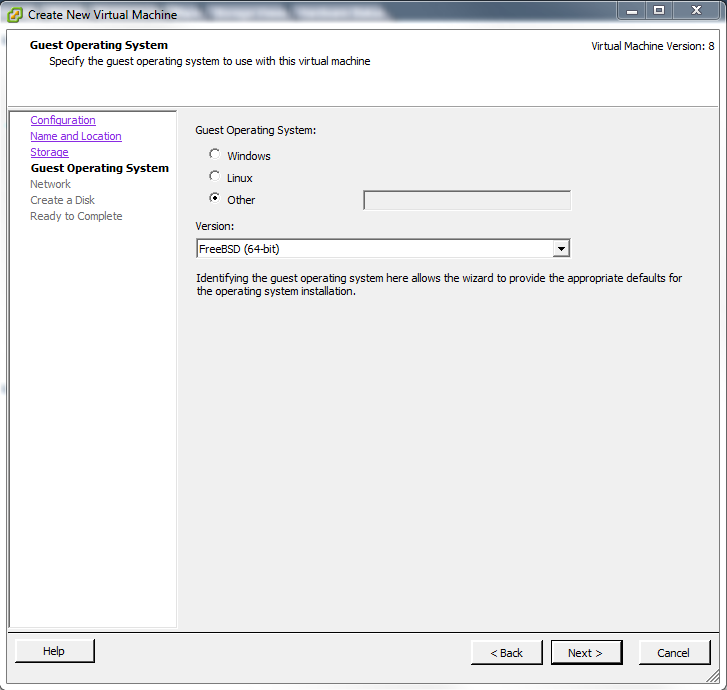 Right-click the virtual machine and select “Edit Settings” to access the screen shown in Figure 2.6p. Increase the “Memory Configuration” to at least 8192 MB. Under “CPUs”, make sure that only 1 virtual processor is listed, otherwise you will be unable to start any FreeNAS® services. To create a storage disk, click Hard disk 1 ‣ Add. In the “Device Type” menu, highlight “Hard Disk” and click “Next”. Select “Create a new virtual disk” and click “Next”. In the screen shown in Figure 2.6q, select the size of the disk. If you would like the size to be dynamically allocated as needed, check the box “Allocate and commit space on demand (Thin Provisioning)”. Click “Next”, then “Next”, then “Finish” to create the disk. Repeat to create the amount of storage disks needed to meet your requirements. If you are running ESX 5.0, Workstation 8.0, or Fusion 4.0 or higher, additional configuration is needed so that the virtual HPET setting does not prevent the virtual machine from booting. If you are running ESX, while in “Edit Settings”, click Options ‣ Advanced ‣ General ‣ Configuration Parameters. Change “hpet0.present” from true to false, then click “OK” twice to save the setting. If you are running Workstation or Player, while in “Edit Settings”, click Options ‣ Advanced ‣ File Locations. Locate the path for the Configuration file named filename.vmx. Open that file in a text editor, change “hpet0.present” from true to false, and save the change.